Founded in 1451, the University of Glasgow is the fourth oldest university in the English-speaking world. Originally located on High Street in the city centre near Glasgow Cathedral, in 1870 it moved to the stunning collection of buildings perched upon Gilmorehill today, where it continues to watch over the bustling city and picturesque tenements of Glasgow’s West End. The University of Glasgow tours, run by Glasgow University Students' Representative Council, will take you on a fascinating journey around some of the university’s most significant spots - from philosopher Thomas Reid’s tombstone and the atmospheric cloisters, to the very same staircase Lord Kelvin would take from his house to his laboratory - whilst discovering the connections of James Watt, Adam Smith and Isabella Elder whose names are inscribed on the university’s Memorial Gates. Look at our Facebook or Twitter page for upcoming seasonal themed topics, and to see our short promotional video. 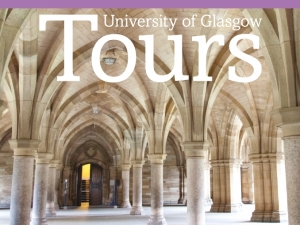 While we take every opportunity to ensure the details for Historic Tours of Glasgow University are accurate, we always advise that you contact the event organiser before setting out for the event to avoid disapointment.